They are all photos taken by G. H. Wilkinson, who with S. Cotterell produced ‘London and North-Western Locomotives’ which was published by The Holland Co. 12 Cherry Street, Birmingham in 1899. It is thought they are all somewhere on the Trent Valley Railway about 1900. They were taken at the same location, but where ? A question from the Webbmaster - The edge of the ballast, is it unusual, seems well made ? With reference to your enquiry for pictures No 175. 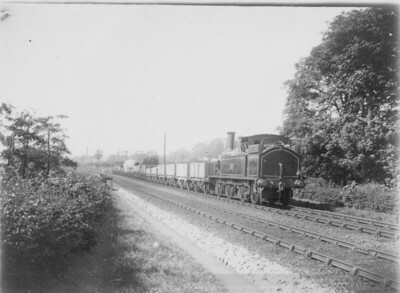 This was the standard practice for main running lines by the LNWR. Information can be found in Jack Nelsons`s book LNWR Portrayed & also the LNWR liveries book by the Historical Model Railway Society which has a bit more information in it though i think both books are out of print now ? There seem to be signals in the background, but the Trent Valley Line has changed so much since 1900 that I don�t think it likely that the location can be identified.